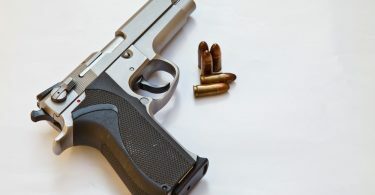 There are a lot of different gun accessories on the market. Their common purpose is to increase the weapon’s efficiency. But the main goal is to acquire the target in the most effective way. When it comes to quick target acquisition, there are two possible options – scopes and red dot sights. Of course, the main choosing factor is your personal preference and the purpose. If we are comparing red dot sights with rifle scopes, we are talking about short-distance aiming. Red dot sights can’t compete with the scopes on a long distance. Red dot vs scope – let’s talk about what you need to know to choose between them. Rifle scopes are usually heavier due to the weight of the lens. They provide magnification, but it narrows your field of view. Red dot sights are lightweight, ergonomic, parallax free and provide unlimited eye relief. 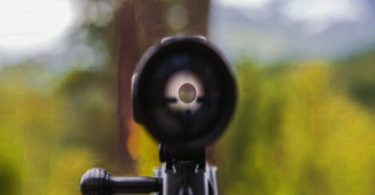 With a rifle scope, you will need more time to get in the right position for shooting. It means that red dot sights provide quicker target acquisition possibilities than scopes. If your purpose is quick target acquisition on a short distance, then red dot sight is what you need. Here are some tips on how to pick the right item. As I mentioned before, red dot sight should be lightweight and produced from high-quality materials. Solid construction of an item ensures its durability and reliability. It should be also easy to install and remove. Some of the items come with suitable mounts. You don’t want to run out of battery while hunting or target practice. When picking red dot sight, you need to check the power system. The longer the battery lasts, the better it is. Some of the sights are equipped with two power systems – for day and night. The automatic switch on/off system will prolong the battery’s life. Night vision mode is also important, because the red dot should be crisp and clear despite the light conditions. The best reflex sights are waterproof, fogproof and shockproof for full protection. It allows you to eliminate the environmental influences. With multi-coated items, you won’t depend on the weather conditions. Red dot should be crisp and bright despite the light conditions. It should be adjustable for both bright day light and lowlight environment. Some of the items provide the auto adjustment of the red dot brightness. It is an advantage, because it eliminates the time waste. If you are looking for something to increase your target acquisition capabilities, here is an item for you. 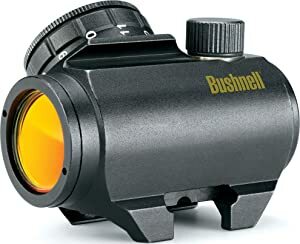 Bushnell Trophy TRS-25 Red Dot Sight Riflescope is a trophy red dot 1x25mm providing easy target acquisition. The front lens is tinted amber, and the whole item is characterized by amber-bright high-contrast coating. Red dot is created by the tilted front lens reflecting the light. The amber-bright optic helps you to distinguish the target and acquire it really fast. The sight is multicoated to provide clear vision, even in the lowlight conditions. This item is well-designed and that’s why the red dot LED light source is secured inside the scope. It provides the durability and practicality of this item. This sight gives you an opportunity to see with both eyes open with the eye relief system. You won’t need to center because the item is characterized by parallax free design. The dot just follows your eye movement. The recoil won’t loosen the windage adjustment, because it is tight enough. Another advantage is that red dot setting is adjustable by the control knob. The red dot has 11 settings. The light transmitting capability of this item is 91%. The sight is also waterproof, fogproof and shockproof. That’s why with this item you are ready to acquire any target despite the environmental conditions. It gives you an unlimited field of view and holds zero very well. The battery lasts for 3,000 hours. By choosing this item you will get a solid, reliable and sturdy red dot riflescope for a reasonable price. 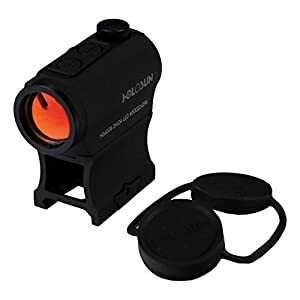 All the advantageous features of this sight make it one of the best red dot sights under 200. 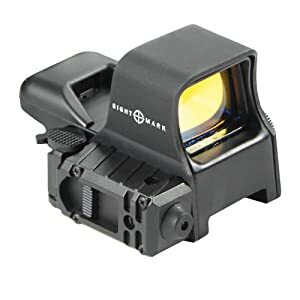 Sightmark Ultra Shot M-Spec Reflex Sight is a great product to use in any shooting environment. It has 12 brightness settings – 6 for day light and 6 for night hours. Another advantageous feature of this item is low power consumption, so you don’t have to worry about running off a battery. The battery lasts for 1,000 hours. And the magnetism alloy housing provides exceptional durability and reliability of the item. Digital switch controls ensure the easy usage of the sight. A quick detach weaver mount provides the fast and easy installation and removal. The device is protected by the shielding hood. The additional protection is ensured by internal locking system. This sight is shockproof and can resist up to .50 caliber recoil. It is equally good for hunting, target practicing and competition purposes. Bushnell Tactical First Strike 5 MOA Red Dot Riflescope is well-built, solid and reliable product. I can easily name this sight one of the best budget red dots. It is waterproof, fogproof and shockproof. Due to this full protection, you can use this red dot for any shooting purpose, despite the environmental conditions. This item is also very ergonomic and compact-sized. It doesn’t provide any extra weight and is really easy to use and transport. Another great advantage of this sight is the capability to automatically adjust to light conditions. This system helps the battery to last for a long time. The exceptional light transmission is provided by multi-coated optics. It is great for quick target acquisition and is easy to attach and detach. If you are interested in increasing the speed and accuracy of your shooting, I have something for you. 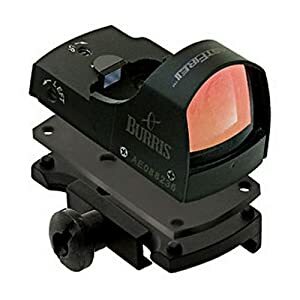 Burris FastFire Red-Dot Reflex Sight with Picatinny Mount includes 4 MOA dot reticle and makes the aiming pretty easy. The aiming red dot is always in focus and aligned, providing the accuracy of target acquisition. You will be glad to know that the battery of this item lasts for an exceptionally long time – 20,000 hours! You are ready for any target despite the weather, because it is waterproof. The steel construction of the item increases shooting speed. And the included Picatinny Mount is a plus, because it makes the item easy to install and remove. The construction itself is very small and weighs only 1.6 ounces. On the other hand, it is very tough and durable. It is fully adjustable, when it comes to windage and elevation. The automatic on-off switch adjusts the brightness of the dot to the light conditions, so you don’t have to adjust it by yourself every time. 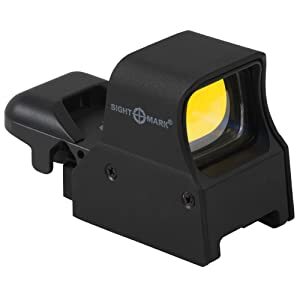 Sightmark Ultra Dual Shot Pro Spec NV Sight QD is known for its precision accuracy. 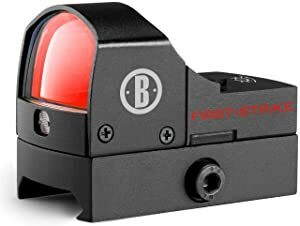 If you are looking for a red dot that will make quick target acquisition extremely easy, then this product is for you. Included mounting system is characterized by its quick attach and detach capability. The item has 4 reticle patterns – 5 MOA dot, 3 MOA dot with 50 MOA circle, 3 MOA dot with 50 MOA crosshair and 3 MOA dot with 30 MOA circle/crosshair. This variety gives you all the necessary capabilities to increase the efficiency of your shooting. Inbuilt side-mounted red laser is perfect for quick target acquisition. 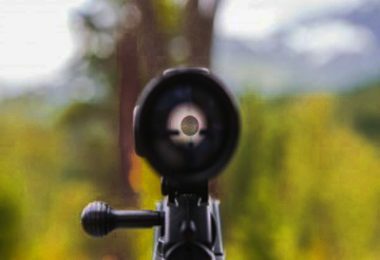 A shooter can adjust his view to his needs with one of the four illuminated reticle patterns. You will be glad to find out that this item is equipped with a night vision mode. The parallax is eliminated by the double-pane glass lens system. And the internal locking system holds zero perfectly. Sightmark Ultra Dual Shot provides an unlimited eye relief. Another incredible product on my list is Ultra Shot Pro Spec Sight NV QD. This is a well-built item, equipped with a night vision mode. It is one of the best reflex sights under $200. 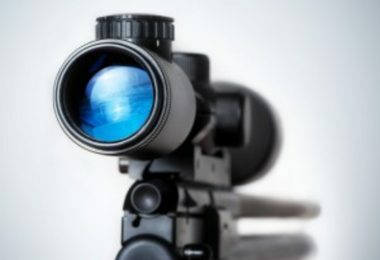 Wide customization possibilities of this sight are ensured by four reticle patterns. They provide an equal accuracy at both daylight and night. This item has all the advantageous features as another sight of this manufacturer reviewed above. And it also has a Picatinny rail attachment which makes this sight extremely easy to use. The internal locking system holds zero. That’s why a user doesn’t have to adjust the sight in the field every time. By picking this item you will get a high-quality product for a reasonable price. The red dot is crisp, clear and very bright despite the light conditions. If you are looking for the best ar-15 red dot under $200, I’ve got something exciting for you. 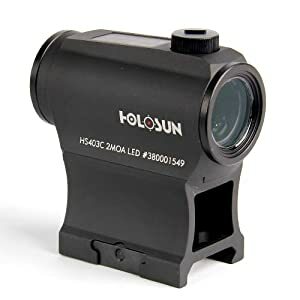 HOLOSUN HS403C Solar Power Micro Red Dot Sight stands out among its competitors due to its two power systems. The primary solar power system is active at day time and adjusts red dot to available light. In the dark, the sight switches to the battery power. And the battery lasts for 50,000 hours, which is extremely impressive. With this sight, a shooter doesn’t have to worry about the battery running out. It is solar powered right away. And the intensity of red dot adjusts to ambient light automatically. On the other hand, you can easily adjust it by the + and – buttons. Another advantage of this sight is 12 brightness settings – 10 for daylight and 2 for the night vision mode. This variety of settings gives a shooter maximum target acquisition capability. The dot is 2MOA size and is parallax free. Solar Power Micro Red Dot Sight is fully waterproof and is made form high-strength aluminum. This sight provides an unlimited eye relief. Solid construction from high-quality materials makes this item very durable and reliable. 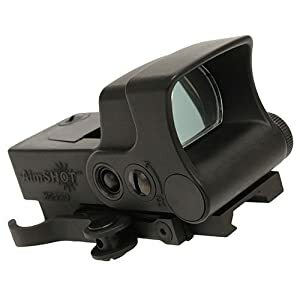 Among the top choices on the market I can name Aimshot HGPRO-B-G Green Cross Hair Reflex Sight due to its advantageous features. It is Hg-pro-b-g Reflex sight with green illuminated crosshair reticle. It is equally good for target practice, hunting and competition goals. Included battery lasts for more than 2,000 hours and provides a shooter with confidence. The accuracy in quick target acquisition is ensured by nine step brightness adjustment with a night vision mode. The 34mm lens is coated for the additional protection and is parallax-free. Due to this effective design, your target aiming becomes very easy. And it is waterproof to 30M. Full windage and elevation adjustment is also provided. This sight is easy to install and remove, because it has integrated quick release system for Picatinny rail. HOLOSUN HS403B Micro Red Dot Sight (2 MOA) with AR Riser is well-built from high-strength aluminum item. Ergonomic design of the sight provides its stability and durability. The battery lasts for 50,000 hours and is motion-awake with the 8 hours shut off. It gives you the possibility to forget about the battery running for more than 5 years! The parallax-free construction allows you to acquire rhe target very quickly – as soon as red dot is on the target, you are ready to shoot. 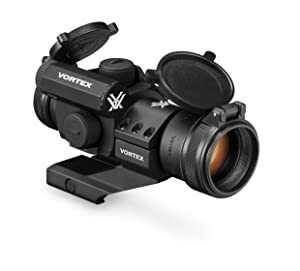 Vortex Optics StrikeFire 2 Red/Green Dot Sight is a well-designed item, characterized by rugged construction that withstands recoil. This sight is suitable for any shooting purposes, and you can buy it for a reasonable price. This item provides good eye relief for quick target acquisition. The additional comfort for a user is ensured by the possibility to pick dot color – red or green. The auto-shutdown 12-hour system prolongs the battery’s life. Depending on the brightness settings, the battery lasts up to 6,000 hours. The dot has 10 brightness settings, including 2 settings for night vision mode. You can safely use this product despite the weather. Necessary protection from environmental conditions is provided by o-ring seals. They prevent penetration of moisture, dust or debris. It is one of the best ar-15 red dot under $200, because it puts the optic bore center 40 mm above the base and provides lower 1/3 co-witness with iron sight on the flat top of the rifle. I hope that this article was useful and helped you to pick the best reflex sight under $200. 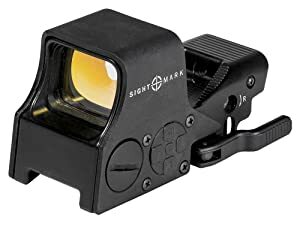 Reflex sight is what you are looking for, if you are interested in a quick target acquisition. There are different important features you should keep in mind, when picking an item. The good red dot sight should be stable, reliable, compact, parallax-free and provide an unlimited eye relief. There’s nothing more efficient in quick target acquisition as a good red dot sight.